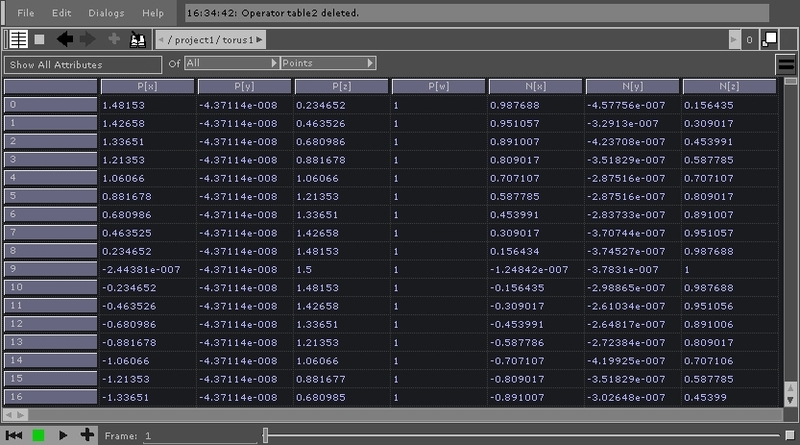 The Geometry Spreadsheet was one of TouchDesigner's Pane Types. Change to Geometry Spreadsheet by using the Pane Type Menu or using the Alt+7 shortcut. Currently, use a SOP to DAT to look at SOP data values. It shows detailed information about Points or Primitives in a SOP. Currently, use a SOP to DAT to look at SOP point/polygon XYZ and other attributes. Formerly a Pane type. 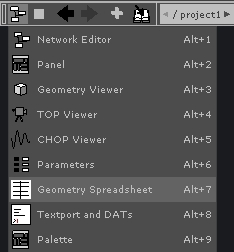 There are 8 pane types; Network, Panel, Textport, Geometry Viewer, TOP Viewer, CHOP Viewer, Parameters, Graph Editor for CHOP Channels, or a Geometry Spreadsheet.